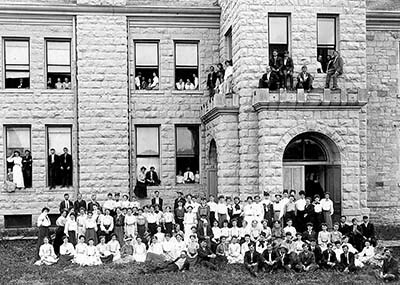 Current and would-be teachers from the county's nearly 120 city and rural schools gather in 1905 for a "normal institute," which is how most local teachers at the time were trained. In early years, establishing education involved teaching teachers, and for many years this was done locally. Until 1877, teachers merely had to write their names, read a paragraph from a newspaper, and answer an oral question or two to prove they were qualified. Some teachers enrolled in “normal schools,” established in Kansas first in Emporia, then with branches in Hays and Pittsburg. But most were trained in “normal institutes” established in each county. It was not until 1947 that teachers had to be certified by the state, and it was not until 1959 that a college degree became a requirement for teaching. The heyday of normal institutes was in the early 1900s, when, every summer, current and prospective teachers would gather for a two- to four-week school conducted by local superintendents and typically presided over by a superintendent from another county. In 1905, a total of 143 teachers and would-be teachers enrolled in Marion County’s institute at the Hill School in Marion. Classes ran from 7:30 a.m. until 12:30 p.m. Tuesday through Saturday and included instruction in algebra, arithmetic, bookkeeping, geography, grammar, government, history, physiology, physics, reading, and spelling, which at the time was referred to as orthography. Teachers already certified had to attend for two weeks. Others, including recent graduates of city and country schools, attended all four weeks. “The older teachers must attend to avoid ‘ruts’ and keep in touch with progress in the education world,” a notice in the Marion Record stated. School boards often visited the institute and chose which teachers to hire based on their performance. Tuition was $1 (the equivalent of $28.53 total), with study materials costing 10 cents — 15 cents if mailed. Room and board was available throughout Marion. “Probably the liveliest session of the four weeks,” the Record reported at the time, “was the game of ball played between Hillsboro’s [city] team and the institute team. “Mr. J.W. Schidler, superintendent of the Hillsboro schools, arose and in a dignified and ceremonious way announced the victory for Hillsboro, remarking in the course of his little spiel that he was very glad the laurels had been carried off by his hometown. “‘You are glad, are you?’ came in thunderous, gladiatorial tones from a deep-chested institutor. “‘Yes, I am glad,’ re-echoed the Hillsboro pedagogue. For the record, Hillsboro won, 11-6, at the Marion ball diamond.